I use a converted chest freezer as my kegerator/keezer. With the aid of some modifications like a collar and an overriding thermostat, it works really well. 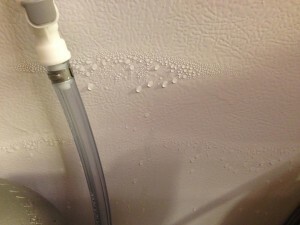 The big downside I’ve experienced is… condensation. Not just beads of water on the sides, I had pooling water in the bottom. Not a good thing. This varies by how often I’m in it, the season and current weather, but the fact is, a chest freezer just isn’t designed to deal with condensation like a refrigerator is. 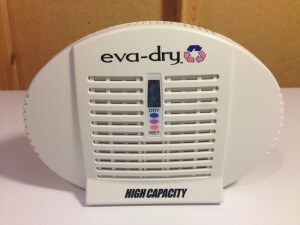 Enter the Eva-Dry E-500. 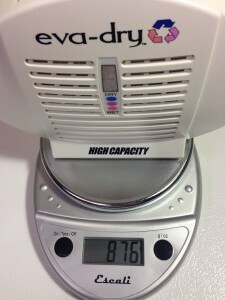 The Eva Dry contains a desiccant material that absorbs moisture. The beads inside this unit absorb moisture. As they do that they change color. When they have gone from blue to pink, you know it’s time to “renew” the unit. 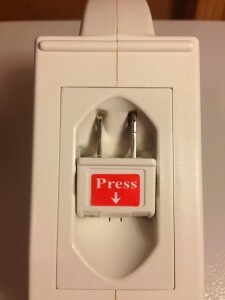 This is done by removing it from the kegerator and plugging it into an outlet. 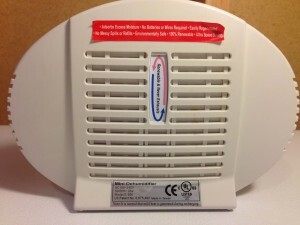 The integrated heating element drives off any built up moisture. When the beads turn blue (overnight), you’re ready to go. I don’t have to do this often, usually every couple months. Absorbs Excess Moisture. No batteries or wires required. Easily regenerated. No messy spills or refills. Environmentally safe. 100% renewable. Ultra space saving. Bottom of the unit. This flips out when it’s time to recharge. It lays flat during normal operation. Trial: I recharged this unit on June 22. I’ve known that this works, but I wanted to put some numbers to it. Pictures and testing were completed in my collared deep freezer based kegerator. I checked this around once per week. Here is a picture of what I would call the first significant signs of moisture build up. This was taken on August 10th. That’s 49 days into the test. Here’s what the beads looked like on August 10th. The beads are what I would call and translucent pink-ish. I left the unit in place for another week to see what would happen with moisture content. It predictability… continued to get worse. On the 18th, I recharged the unit and wiped down the inside of my kegerator to test conditions without the Eva-Dry in place. This picture was taken 8 days later at my first weekly test. This is what I would call a similar level of moisture after only 8 days vs 49 days with the Eva-Dry. I have no doubt that water would end up pooling in the bottom of my kegerator, in relatively short order, without the Eva-Dry in place. I took the final weight of these on 8-17. My Escali Primo has it coming in at 876 grams. And again the next day after recharging. It came in at 772 grams. A full 104 grams of water was driven off during recharging. Using my Fast Weigh MS-500-BLK I measured out right at 104 grams of water. 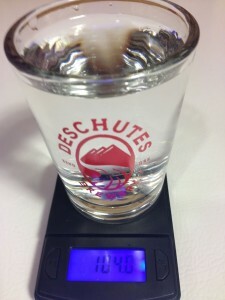 I used the tare feature so this is actually 104 grams of water. It nearly fills a taster glass. 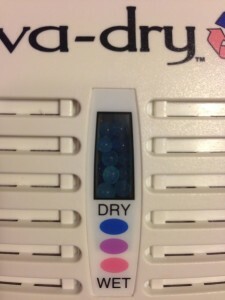 This represents what the Eva-Dry absorbed and the water that would have otherwise been sitting in my kegerator. I’ve had this same unit since October of 2008. This trial took place around August of 2013. As of this update (February of 2018), other than a slightly curling label, this looks like new and it certainly works like new. 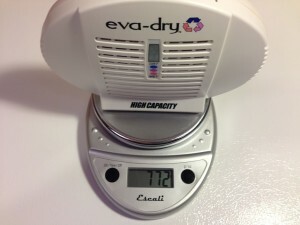 The Eva-Dry E-500 has kept my kegerator dry for years. It is a Top Find and I’m glad to have it and can confidently recommend it to you! Troubleshooting: Still having problems? 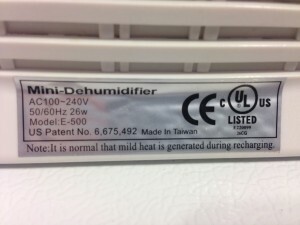 Many, many HBF Readers use this unit to handle kegerator condensation issues. I’ve recommended it for years and used it in my own kegerator for years. I hear mostly great things back from people. Periodically, I’ll hear that it didn’t fix the problem. I’m convinced most of these cases are capacity related. If you’re still having issues, check out the recommendations below. Make sure your kegerator is as tight as possible. Put a flashlight on the inside and (in a dark room) look for light. Add weather stripping or insulation to problem areas. 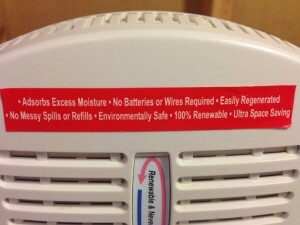 Capacity Issues: If you’re still having condensation issues I would suggest adding another unit. 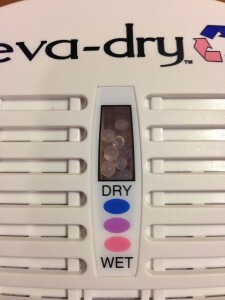 There is no doubt the Eva-Dry E-500 absorbs moisture. After that it becomes a question of capacity. An illustration – If I spill a half gallon of water and put a single paper towel on it, it would immediately soak the paper towel and leave water behind. I could say, “paper towels don’t work.” It’s not that paper towels don’t work, they do work. I just didn’t use enough paper towels to address my problem. If everything else is right and you’re still having condensation problems, I am suggesting that you should consider adding more absorption capacity in the form of an additional unit. This entry was posted in Amazon, Draft, Draft Top Picks, Kegerator, My Kegerator, Reviews, Reviews & Top Posts, Tips, Top Posts on September 2, 2012 by admin. I bought one of these several weeks back to try out. 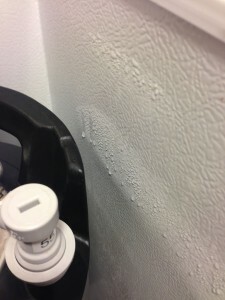 I didn’t have a lot of pooling water but was seeing some frost buildup on the walls of the keezer at times and knew if temp dropped enough it would turn into water. Got the unit and hung it in the keezer underneath the basket. Walls stayed clear of any frost. After a period of time the pellets changed color and removed it to recharge. Noticed immediately the much heavier added weight (from the moisture it had collected) and was thrilled to know it was doing its job. After recharging it felt lighter but not as light when first installed. But the crystals had changed color so I replaced it in the Keezer. I’ll see if it gives as long a period before recharging. I am very happy with it. Having bought it on a sale announced on HBF I feel it was a GREAT bargain.